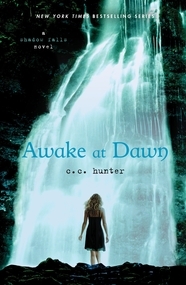 Articles tagged "Awake at Dawn"
Two Young Adult Signed Books Giveaways! UPDATE: These contests are now closed and the winners have been notified via e-mail. Thanks to eveyone who entered! 1. 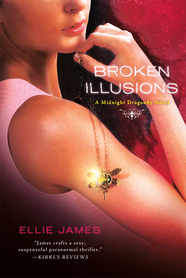 Win signed copies of SHATTERED DREAMS and BROKEN ILLUSIONS by Ellie James and the necklace from the book covers (see below)! In the Midnight Dragonfly series, Trinity Monsour wants nothing more than to live a normal life. But Trinity is different. She sees visions, and for those she’s seen, it’s already too late... Read more here. Librarians, enter to win these signed books and the necklace by sending your name, your library, and your full mailing address to Library-at-MacmillanUSA.com (Subject: YA #1) by Friday, May 25th. 2. 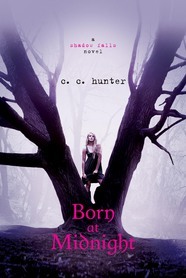 Win signed copies of BORN AT MIDNIGHT, AWAKE AT DAWN, and TAKEN AT DUSK by author C.C. Hunter! 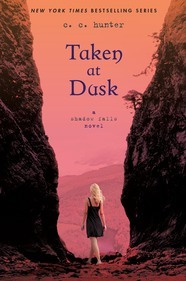 In the Shadow Falls series, Kylie Galen's mother ships her off to Shadow Falls, a camp for troubled teens, but within hours of arriving it becomes painfully clear that her fellow campers aren’t just troubled... Read more here. Librarians, enter to win these signed books by sending your name, your library, and your full mailing address to Library-at-MacmillanUSA.com (Subject: YA #2) by Friday, May 25th. This sweepstakes is open to librarians in the United States. Librarians are welcome to enter both contests! More eligibility details below. 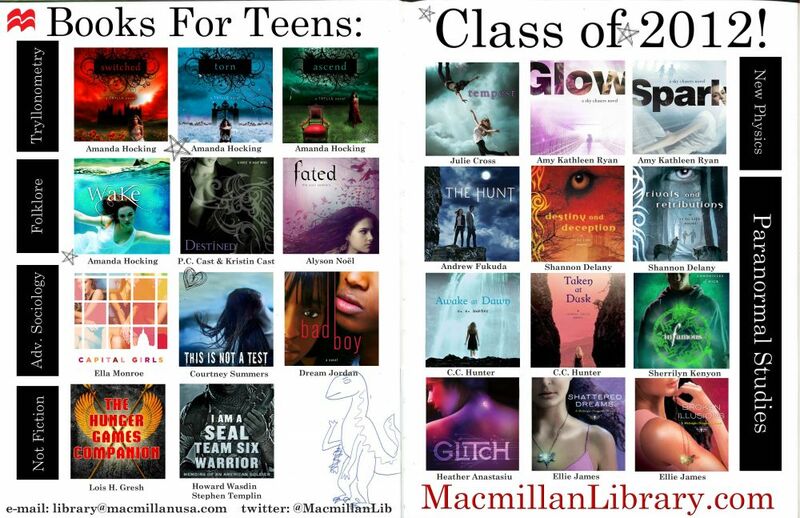 Books for Teens: Class of 2012! Click here for a printable PDF of the above flier! 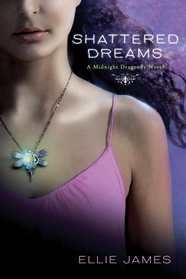 Welcome to our list of featured teen titles for 2012. Here you'll meet time-travelers, trolls, and sirens. You'll trek through deep space, uncover dangerous secrets, and hunt down demons. You'll learn to ride a horse and raise the dead. Your heart will be broken, you will find courage when there's little hope, and you will come to know your true self. Join us on a new adventure! Amanda Hocking is widely considered the exemplar of self-publishing success in the digital age and we are delighted she has joined us at Macmillan! Over the next year you'll see two exciting series from Hocking: the USA Today bestselling Trylle series, which has already been optioned for film, and the never-before-published Watersong series. Each of the Trylle novels will also contain all-new, never-before-seen short stories set in the magical world of the Trylle! A couple things made that day stand out more than any other: it was my sixth birthday, and my mother was wielding a knife. When Wendy Everly was six-years-old, her mother was convinced she was a monster and tried to kill her. It isn't until eleven years later that Wendy discovers her mother might have been right. With the help of Finn Holmes, Wendy finds herself in a world she never knew existed--a world both beautiful and frightening, and Wendy's not sure she wants to be a part of it. This book contains a new, never-before-published bonus story, “The Vittra Attacks,” set in the magical world of the Trylle. Read the first pages of SWITCHED on Facebook now! Wendy thought she finally understood who she was and what she wanted, but now she's caught between two worlds, torn between love and duty, and she must decide what life she is going to lead. This book contains a new, never-before-published bonus story, “One Day, Three Ways,” set in the magical world of the Trylle. With a war looming on the horizon, Wendy’s fate seems sealed. But everything she sacrificed might be in vain if she can’t save the ones she loves. Her whole life has been leading up to this, and it’s all coming to an end. This book contains a new, never-before-published bonus story, “Ever After,” set in the magical world of the Trylle. Nominated for YALSA's 2013 Best Fiction for Young Adults! Even over the sea, Thea could smell the blood on her. When she breathed in, it filled her with a familiar hunger that haunted her dreams. Gemma Fisher lives an ordinary life in the quiet seaside town of Capri, but when three beautiful girls arrive and mesmerize her friends and neighbors everything changes. After a chance encounter with the girls, Gemma wakes up alone on the beach with no memory of what occurred. Now Gemma has powers she can’t control, she’s growing more beautiful, and she has a strange effect on men that makes them unable to resist her—especially her voice. Soon she must make a decision: keep the life she no longer fits into or follow the call of the Watersong into a world brimming with dark beauty and secrets. The enchanting second book in the Watersong series following the adventures in WAKE. Harper only wanted a safe, normal life. But when her younger sister Gemma runs off with a dangerous clique of magical girls everything changes. Okay, so it's true. I can time-travel. But it's not as exciting as it sounds. Jackson Meyer spends most of his time in 2009, but he can travel back through time. It’s not like the movies--nothing changes, there are no space-time-continuum issues--it’s just harmless fun. That is until dangerous strangers arrive at his dorm and shoot his girlfriend. In his panic, Jackson jumps to 2007, but this time he can't get back. Now he must find a way to return to 2009 and save the girl he loves. Film rights for TEMPEST have already been optioned by Summit Entertainment, the studio behind the Twilight movies! Watch the book trailer for TEMPEST here and read the short story prequel on Facebook now! Nominated for YALSA’s 2013 Quick Picks for Reluctant Young Adult Readers! The other ship hung in the sky like a pendant, silver in the ether light cast by the nebula. Waverly and Kieran, lying together on their mattress of hay bales, took turns peering at it through a spyglass. This 2012 Best Fiction for Young Adults-nominated title will take your teens into deep space. Part of the first generation to be successfully conceived on the space ship Empyrean, 15-year-old Waverly and her boyfriend Kieran will be pioneers of New Earth. But a violent betrayal by the Empyrean's sister ship will change everything. Waverly and Kieran are separated and each find themselves at the helm of dangerous missions. School Library Journal gave GLOW a starred review and Booklist said, "Fans of the Hunger Games series will zip through and clamor for the next installment."